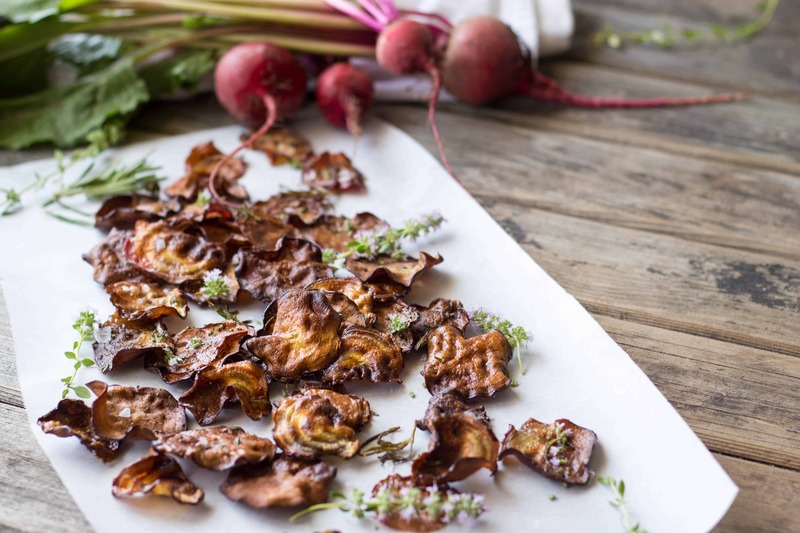 This EASY recipe for beet chips are light and crisp, salty and satisfying. They’re made in the oven so they’re healthy too! Paleo, vegan, gluten free. I harvested the last of my beets this week, which was a little bittersweet. And I mean that literally- beets themselves are bittersweet! Or rather, more like earthy-sweet. Either way, love ’em or hate ’em, beets are one of the healthiest vegetables you could and should be eating. I wasn’t always a fan, but over the years beets have won my affection, and these beet chips played a major roll in our courtship. Light, crisp and totally addictive, you might actually forget you’re eating something healthy! Preheat the oven to 350 degrees. Use a mandolin to slice the beets into even, paper thin pieces. Line 2-3 sheet pans with parchment paper, then use a pastry brush to spread a thin coat of oil on the bottom of each. Alternatively, you can use cooking spray instead. Lay the beet slices out in an even layer. It’s okay if they touch, but try not to let them overlap. Brush the tops with another thin layer of oil, sprinkle with salt, pepper and herbs if using. Place in the oven and keep a close eye on them while they bake for about 20 minutes. They’ll be done when they’re golden brown and crisp. Some of the chips might be done before the others, so use a pair of tongs or a fork to remove the browned chips and let the others continue baking. Remove the chips from the oven and allow to cool. Serve immediately. You can use a variety of different seasonings, so feel free to experiment with your favorites! These chips will turn soggy after a few hours, especially in the summer humidity. Pop them in a 200 degree oven for about 5 minutes to recrisp them right up. Unfortunately it is difficult to achieve perfectly even thin slices with even the sharpest knife and the best skills. Mandolins are inexpensive and can be purchased at kitchen stores or online. LOVE these! I go crazy with beets… and sweet potatoes… and zucchini…. and pear chips! YUM! 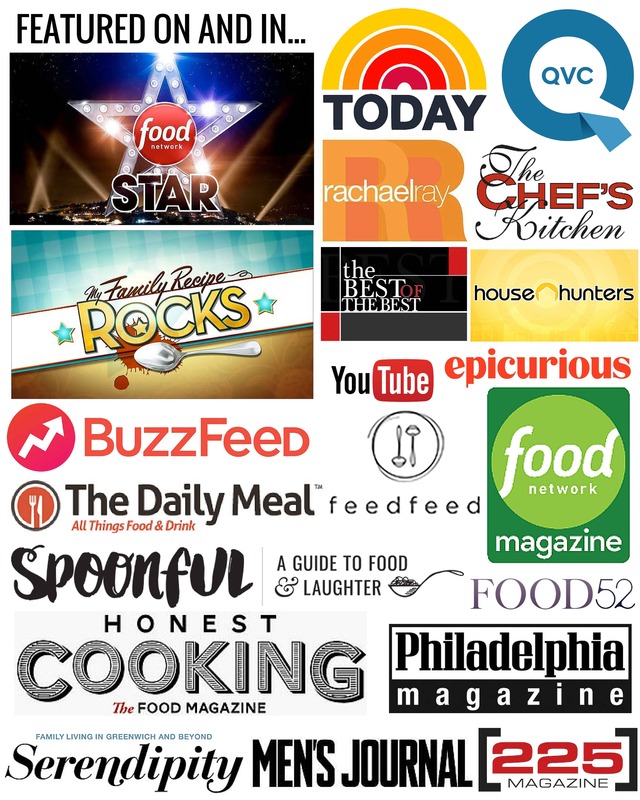 I stummbled upon your lovley blog when I typed “what to make for dinner” into google, goody! Now I’m in love! Thanks so much for all of your wonderful ideas, this is exactly what I needed! I live in Canada, so the season is a bit behind, but your ideas are still helpful. We had a horrible spring for gardening so everything is late this year. The only thing we’re eating from our garden is lettuce and herbs:-( The farmers market has tons of stuff ready though, I don’t know how they do it!!! Well that’s enough babbling for now. Consider me a devoted reader from now on! See you!